While spending the summer of 2012 doing research at CERN, the famed particle physics laboratory in Switzerland, Gerald “Jerry” Wang had a rock-star science moment. That summer, rumors buzzed around the institute that a groundbreaking announcement was imminent. When Wang heard that a special event was planned for the next day in CERN’s auditorium, he and his friends “camped out overnight – sleeping bags, pillows, the whole nine yards,” he recalls. “To see a community of thousands of people so uniformly excited about this thing that humanity's been working toward for 50-plus years – it was one of the distinct privileges of my life to be there,” Wang says. Today he’s a Ph.D. student at the Massachusetts Institute of Technology, using computational simulations to understand the properties of fluids at the nanoscale, where objects are thousands of times smaller than a hair’s breadth. This fundamental understanding could be useful for a range of real-world applications, such as novel desalination technologies and fuel cells. A Department of Energy Computational Science Graduate Fellowship (DOE CSGF) supports his work. In his research with Nicolas Hadjiconstantinou, Wang has specifically studied the structure of fluids confined to nanoscale spaces and how those trapped fluids transport energy. Under typical conditions, transferring energy from a solid to a fluid is relatively inefficient. On a hot day, Wang notes, you’ll cool off much faster by pressing an ice bag against your face than by sitting in a room filled with cool air. Since the 1990s, researchers have observed that fluids next to a solid can form layers parallel to the solid’s surface. But few molecules in everyday fluids exhibit any particular pattern or structure. In super-tight spaces, though, such as capillaries just nanometers in diameter, “the molecules very often have little choice but to settle like a solid,” Wang says. Bands of molecules form parallel to the surface confining them, like layers in a cake. Using computational simulations, Wang has outlined the theory for how these layers form and how far they extend. He’s also examined how material density, temperature and interactions between molecules in the fluid and solid affect the fluid layers. In these nanoscale channels, heat transfer between solids and liquids looks far different than it does at a larger scale. “Suddenly when you try to transfer heat from the solid to what you would imagine is the liquid, you start seeing heat transfer rates that are much, much higher than you would ever imagine is possible for a solid to a liquid,” he says. For his summer 2015 practicum at Argonne National Laboratory, Wang modeled a different nanoscale energy transport phenomenon: waves known as inhomogeneous surface plasmon polaritons, which occur in metals such as gold and silver and in other, more exotic materials. Understanding these waves could be important for designing nanophotonic devices, minuscule light-interacting components that can be used in electronics, computer memory, solar cells and many other applications. Though different from studying fluids, the project was an interesting transport problem at the nanoscale, Wang says, and a valuable introduction to computational science at the national laboratories and on DOE supercomputers. 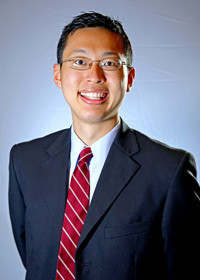 As he finishes his doctorate, Wang hopes to continue his career in nanoscale computation and engineering. Whether he ultimately lands in academia or at a national laboratory, he looks forward to making molecular simulations useful for engineering. He wants to continue to bridge the gap between experiment and engineering design and the computations that inspire so much of it. Image caption: When confined within a carbon nanotube (CNT), fluid can adopt a layered structure in the form of concentric rings. This shows an equilibrium distribution of fluid within a CNT (points) along with theoretical predictions for fluid location (shaded surfaces). Credit: Gerald J. Wang.